Will space tourists fly next year? Virgin Galactic's billionaire founder, Richard Branson, says that "we're about 12 months away" from flying paying passengers to the edge of outer space. But there are huge hurdles between now and then -- such as actually putting the spaceship through rocket-powered tests. After the Bransons take flight, hundreds of people who have paid $200,000 each will go on trips to outer space. "We have nearly 500 people signed up to go," Branson said, "and so a year to 15 months from now, we'll start bringing members of the public up." Those passengers will take a rocket-powered roller-coaster ride to a height of more than 62 miles (100 kilometers), watch the curving Earth beneath the black sky of space, and experience several minutes of zero gravity before descending to a gliding runway landing. SpaceShipTwo is designed to accommodate six passengers and two pilots. The first SpaceShipTwo craft, which has been christened VSS Enterprise, follows in the footsteps of SpaceShipOne, the first privately built plane to take humans beyond that 100-kilometer boundary of outer space. That feat won the $10 million Ansari X Prize for the project's backers, and earned SpaceShipOne a place in the Smithsonian's National Air and Space Museum. How realistic is the timetable? Will the Enterprise really be ready for passengers a year from now? Many previous predictions for the start of commercial service have turned out to be over-optimistic, but it's interesting that the time frame for the predictions is shortening. Just a couple of months ago, Branson declared during a conference in Kuala Lumpur that commercial spaceflights were 18 months away. The SpaceShipTwo rocket plane (known as VSS Enterprise) is dropped from its mothership, known as White Knight Two (or VMS Eve), during the spaceship's first unpowered glide test in October. Since then, SpaceShipTwo's builders at Scaled Composites have begun subjecting the craft to unpowered glide tests. The rocket plane has been carried to an altitude of around 50,000 feet on its carrier airplane, known as White Knight Two, then dropped into the air to test its aerodynamics. The third piloted glide test took place just a couple of weeks ago over California's Mojave Air and Space Port. The next major step will be to light up SpaceShipTwo's hybrid rocket engine for powered tests. The Scaled Composites team, guided by aerospace guru Burt Rutan, will conduct a series of increasingly ambitious test flights -- leading up to the full takeoff-to-landing flight profile, which qualifies as honest-to-goodness spaceflight. If everything goes well, SpaceShipTwo could conceivably fire up and perhaps even cross into the space frontier before Rutan's retirement next April. If SpaceShipOne's development timetable is any guide, that part of the job might be doable. It took less than a year for SpaceShipOne to go from its first glide test to its first spaceflight. 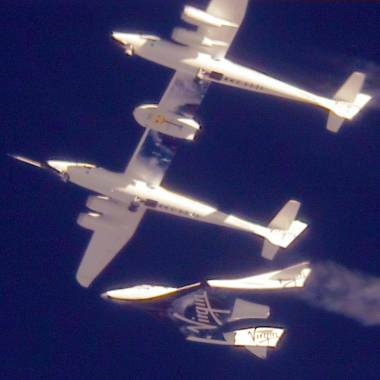 But SpaceShipTwo will need a lot more testing to make sure it's safe enough for passenger service, and any snags along the way could force Branson to revise his timetable. Virgin Galactic has repeatedly said that safety comes first -- and would you expect anything less? Feel free to weigh in with your own thoughts about the dawn of the age of commercial spaceflight.